America’s internet landscapes are rich, pervasive, and very hard to see. The miles of fiber-optic cable that connect the country to the world are mostly visible in fragments—signs for buried cable along the side of a road, telephone poles running between houses forming serpentine labyrinths beneath city manhole covers. These glimpses of networks tend to feature the names of at least a few different companies—sometimes well-known ones, like AT&T, but just as often companies that don’t tend to become household brands or that haven’t existed for years. US-West, MCI/Worldcom, Embarq. It’s hard to really get a grasp of who, exactly, owns all of this stuff and how they came to own it. If those first years of the internet were marked by a dramatic expansion of players in the telecom industry, its later ones have been marked by contraction. According to BroadbandNow, there are currently 2,566 internet providers in the United States. Of their list, 1,230 specifically provide wired connections, and only a handful have complete coverage across the entirety of the United States. Furthermore, a number of companies on their list are subsidiaries of the larger companies that most consumers have heard of, like AT&T or Comcast. It’s even hard to get a sense of how much cable there is—a four-year research study by the University of Wisconsin estimated that the United States has 113,000 miles of long-haul fiber, but that doesn’t even begin to factor in the miles of old coaxial and copper that remain the primary internet connection for many homes across America. Most of the major telecoms snaking their way through the conduits of the American landscape are born out of corporate mergers and acquisitions. 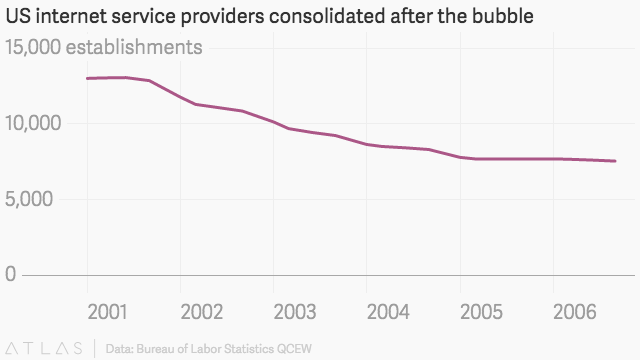 After the first wave of dot-com fervor in the late 1990s, one of the most popular methods for building a large network was buying up failing smaller internet service providers (ISPs) and their networks. If those first years of the internet were marked by a dramatic expansion of players in the telecom industry, its later ones have been marked by contraction, leading to a relatively small and getting-smaller concentration of companies that actually own and maintain the majority of fiber-optic cable networks. This history isn’t typically told in structured data, but in old press releases and SEC filings. Attempting to reconstruct that history often feels like entering a byzantine maze, haunted by the corporate minotaur of AT&T. Due to the company’s longstanding monopoly position, it laid a lot of the US telephone cable routes that would later be the foundation of new internet cable routes. The breakup of the Bell System in 1984 and the further deregulation of the industry through the 1996 Telecommunications Act led to pieces of what was Ma Bell being incorporated into new companies (US-West into CenturyLink, NYNEX and Bell Atlantic into Verizon, etc.). But some of the players in today’s telecom landscape emerged from other infrastructural concerns, such as mining, natural gas, and railroads—just one of many examples of how today’s the so-called information age remains at its heart, an industrial one. Many of the companies in today’s telecom landscape were spun off from AT&T in 1984 when it was forced to break up its monopoly. For example, Level 3 Communications and RCN, today two major network companies based in the United States, began as subsidiaries of Kiewit, a construction and mining company that entered into telecom in an effort to diversify its assets in the 1980. After spinning Level 3 out from Kiewit’s holdings, Level 3 expanded its network by acquiring other networks, including WilTel Communications. Once the fourth-largest fiber-optic cable network in the United States, WilTel began as a subsidiary of the Williams Companies, a major natural gas provider that initially built out its fiber network using abandoned gas pipelines and right-of-way. Kiewit’s third fiber network endeavor, Metropolitan Fiber Services, was sold off to Worldcom in 1996, which was in turn sold to Verizon in 2005. Some of the telecom companies we are familiar with were previously part of now-defunct businesses. The Southern Pacific Railroad offers another example of how American internet infrastructure tended to take advantage of pre-existing infrastructure. Rail right-of-way (the land that runs parallel to the railroad) has historically been a popular location for communications cables—rather than having to negotiate with dozens of property owners to run cable across states, companies could just negotiate with a railroad company for a straight shot for long-distance lines. SPC initially used their right-of-way to build out communications infrastructure for internal communications, later transforming that internal service into Sprint (an acronym for Southern Pacific Internal Network and Telephone) and later Southern Pacific Telecommunications, rebranded as Qwest in 2000 and acquired by CenturyLink in 2010. Merger alchemy tends to remain in legal filings and website redirects rather than changes to the environment or to the lives of most consumers. WilTel Communications and Qwest persist in the landscapes of manhole covers and “call before you dig” signs (who’s going to bother changing signage or forging new manholes?). The companies that make up a lot of the core backbone of the internet as we know it aren’t major household names, because they’re not really in the business of servicing households so much as connecting other networks to each other. Today’s major telecoms exist in the legacy of of heavy infrastructure—rail, natural gas, mining—and corporate conquest. It’s understandable that the public readily forgets and takes for granted the complex network of companies that maintain that utility for granted, the same way they do with other utilities. So why does it matter who owns these different parts of the network or where they came from, especially when most consumers’ primary interface with this world is just their own ISP? Because the consequences of actions by these companies that most consumers never hear of tend to come back to consumers. A few examples: Level 3 (that telecom that emerged from a mining concern) was implicated as the potential weak point through which the NSA was able to spy on communications of Google and Yahoo users. Conflicts between different companies can lead to one network being cut off from another, effectively bringing huge parts of the internet to a halt when data connected to the internet via one network no longer has the ability to connect to another (in the US, these sorts of conflicts mostly tend to involve Cogent Communications fighting with basically everyone else, which is how the company’s CEO earned the title of “most hated man in telecom”). Business-to-business conflicts with consumers caught in the middle were, in some ways, the foundation of the net neutrality battle, which established Federal Communications Commission policy that the internet should be regulated as a utility, and that companies couldn’t privilege certain types of traffic over others. While net neutrality had been a pet concern of policy wonks for a long time before it became the law of the land, incidents that helped bring the policy battle to a head included disputes between last-mile providers, like Comcast and Verizon, over who should bear the infrastructural costs of high-bandwidth traffic from companies like Netflix (interestingly, the issue of Netflix traffic also involved Cogent Communications). The question of who should bear those infrastructural costs (consumers, telecoms, or content providers) has a lot to do with how you conceive of the internet as infrastructure and utility (which, in theory, the FCC’s net neutrality rules are supposed to do). While the rhetoric of Silicon Valley might emphasize going it alone, staying nimble, moving fast, and breaking things, today’s major telecoms exist in the legacy of of heavy infrastructure—rail, natural gas, mining—and corporate conquest. If we accept the idea of that infrastructure as a utility, then understanding who these companies are, what they’re actually doing, and how much of the network they control is really important for holding them accountable and keeping the possibility of an open internet alive.